Can Gum Disease Affect My Overall Health? When you think about going to the dentist, what comes to mind first? For most, it’s teeth. 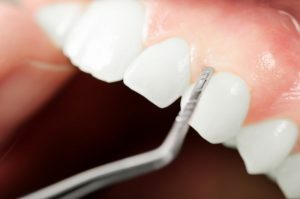 Specifically, the maintenance, examination, and cleaning of teeth. However, during these important dental visits your dentist does another very important job: a careful gum examination. Around 50% of the population has gum disease, which can lead to serious health issues. Not just oral health, but gum disease puts your overall wellbeing at risk as well. Keep reading to learn how gum disease in Sapulpa can affect your health, and the best ways to prevent it in the first place. Gum disease is the infection or inflammation of your gum tissue. In its earliest stages it can be reversed, but untreated gum disease can lead to irreversible gum and bone damage, tooth loss, and other health issues. The earliest stage of gum disease is gingivitis. This stage is usually caused by plaque buildup around the gumline. This plaque mixed with bacteria leads to swollen, bleeding, or irritated gums because it gets in between your gums and teeth. If your disease progresses into periodontitis, the irreversible stage of gum disease, you’ll need periodontal therapy to prevent further damage. What Are the Signs or Symptoms of Gum Disease? How Does it Affect My Overall Health? Besides the damage it can do to your mouth, gum disease can also affect various aspects of your overall wellbeing. This disease can do serious damage to your bone structure in your face, causing a sunken and older appearance. Additionally, gum disease is also linked to increased chances of serious issues like cardiovascular disease, stroke, diabetes, and certain immune disorders. It can also contribute to Alzheimer’s, asthma, osteoporosis, and cancer. In fact, there are over 120 conditions that have been associated with gum disease, making it an issue that can truly affect your whole body. Now that you know the symptoms of this disease, be on the lookout. Use these prevention tips to protect yourself from gum disease and the overall health concerns that come with it. Dr. Parnam Mohanna and Dr. Dalia Georgy are a team of dentists with a passion for providing quality care. They both attend continuing education courses to stay up-to-date on the latest in the treatment of gum disease. They currently practice at Complete Cosmetic Care Dentistry, and they can be contacted through their website or by phone at (918) 216-1000 for any questions.